Manny Ramirez was a driving force behind two Red Sox World Series titles, but when he left Boston in 2008, there weren’t many people rushing to his defense. The Ramirez that returned to Fenway for the tenth anniversary of the 2004 championship team said he was “a new man” who had found God along with work as a coach for the Cubs. In fact, Manny went out of his way to make amends for a nasty episode from his career in Boston. 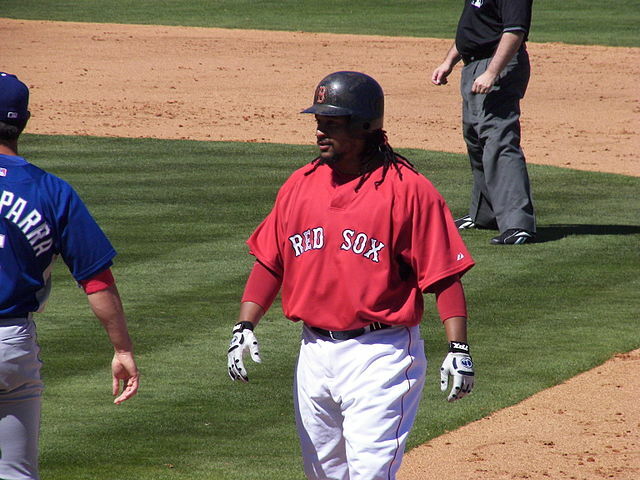 Ramirez posted spectacular numbers for the Red Sox over seven and a half seasons, but by 2008 the wheels had come off the Manny train. There were reports he was faking a knee injury in order to avoid playing, which forced management to consider a trade to get him out of town in his final contract year. That trade to the Dodgers eventually came, but not before Ramirez shoved a 64-year-old traveling secretary for the Red Sox to the ground that June. Before throwing out the ceremonial first pitch (cut off by Johnny Damon in reference to a legendary Manny moment), Manny spoke to reporters about his newly religious life and his effort to apologize to the Red Sox employee he had accosted in 2008 over the availability of extra tickets (Ramirez was earning $20 million a year at the time). “I apologized to [the secretary]. I told him, ‘I want you to forgive me because it was my fault,’” Ramirez said. “I behaved bad here with everybody. I want you to forgive me.” While there were many bizarre moments in Manny’s tenure in Boston, that episode hinted Ramirez was more a troubled individual than a free spirit. Charges of domestic violence that came in 2011 made things seem worse. In 2011, Ramirez was arrested for allegedly slapping his wife with such force that she fell backward and hit her head on the bed of their home. Charges were dropped when Mrs. Ramirez decided not to follow through in court, but it was an ugly coda to a career that ended earlier that year when Manny tested positive for PED use the second time. As it stood, he faced a 100-game ban and chose to retire rather than serve the suspension. Ramirez said at his Fenway return that he came to find God in the period following his arrest and separation from his children. Former Red Sox GM Theo Epstein believed in Ramirez enough to hire him as an instructor for the Cubs’ AAA affiliate. Ramirez will work as a hitting instructor and play a few games a week. Because of his multiple suspensions for drug use, few believe Manny’s terrific stats will get him into baseball’s Hall of Fame. Over the course of his nineteen-year career, he cracked 555 home runs and posted a .312 batting average with a .411 OBP.